After a long and somewhat confusing recruiting process, William Campbell is officially commited to Michigan! Link. This is a huge committment for Rodriguez and his staff, who have already put together a very respectable top 10 class for 2009. Landing Campbell will easily knock Michigan into the top 5. But it wasn't easy. Last year Campbell verbally committed to Michigan before the season...actually even before the summer. But then he decommited, like so many players are doing these days. He kept Michigan on his radar, but also looked at LSU and Miami. It was last week that the world stopped rotating for a while when Campbell said something to the effect of "I'm not coming to Michigan". But there was some chatter on the web that a certain W. Campbell has been added to the U of M online directory. So mass confusion had set in. I decided to stay away from the news until he made his official announcement, which he did in the 3rd quarter of the US Army All-Star game yesterday. He sat at a table with 3 hats. Michigan, LSU and Miami. He picked up the Michigan hat and put it on. Case closed. 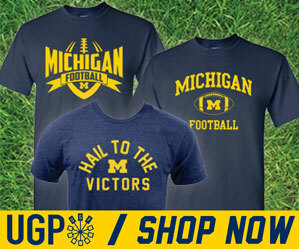 Click this link for a visual representation provided by our friends at MVictors. So what does Michigan get? Campbell (6-5, 310) is a 5-star recruit from Detroit's Cass Tech high school. He is rated, according to Rivals as the #25 player overall in the country and #4 at defensive tackle. Bill Kurelic, recruiting analyst for ESPN.com says he has Campbell as the #1 player in the state of Michigan, and #2 overall in the midwest. Not bad. He will enroll this week, along with 7 other Michigan recruits to get a head start on the 2009 season. We'll see if we can get some pics/video up on here this week.